The above info came from Fractyl2, and was edited by yours truly (contact me). 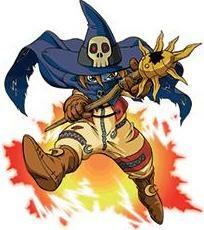 The image came from W.
Wizardmon is a Digimon from a mysterious part of the DigitalWorld called Witchely. Originally, he appeared to be another of Myotismon's lackies in the search for the Eighth Child, but in actuality, he sought to find the Eighth Child to unite her with her partner, Gatomon. Wizardmon was originally a loner looking out for number one, until Gatomon saved him from death and her kindess caused him to open his heart. Wizardmon aided the DigiDestined in their fight and sacrificed himself to protect Kari from Myotismon's attack. His death evoked the Crest of Light, allowing Gatomon to Digivolve to her ultimate form to avenge Wizardmon. Apparently, Gatomon and Wizardmon had a romantic relationship.